Enjoy old-fashioned Disney animation as we present a series of Disney classics. The feature is shown with subtitles/closed captioning. Snacks permitted! 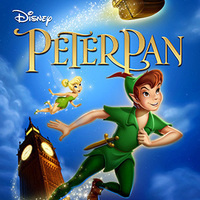 In this Disney animated film, Wendy (Kathryn Beaumont) and her two brothers are amazed when a magical boy named Peter Pan (Bobby Driscoll) flies into their bedroom, supposedly in pursuit of his rebellious shadow. He and his fairy friend, Tinkerbell, come from a far-off place called Neverland, where children stay perpetually young. Enchanted, the kids follow him back. But when Pan's nemesis, the pirate Captain Hook (Hans Conried), causes trouble, the kids begin to miss their old life.